Colombo, January 28: It’s not about strengthening relations on political grounds, it’s maintaining relations with solidifying people to people-oriented development. Connecting through distance, Sri Lankan President Maithripala Sirisena flagged off a new train supplied by India. The train, self-propelled Diesel Multiple Unit (DMU), was procured under Indian concessional financing by Sri Lanka Railways. The train made its maiden journey from Fort Station in Colombo to Kankesanthurai Station in Jaffna. The train set has best-in-class passenger amenities with fully rotating seats in the Air-Conditioned Chair Cars, on-board Infotainment system, GPS-based passenger information system and modular interiors. The train can travel at a maximum speed of 120 kmph. 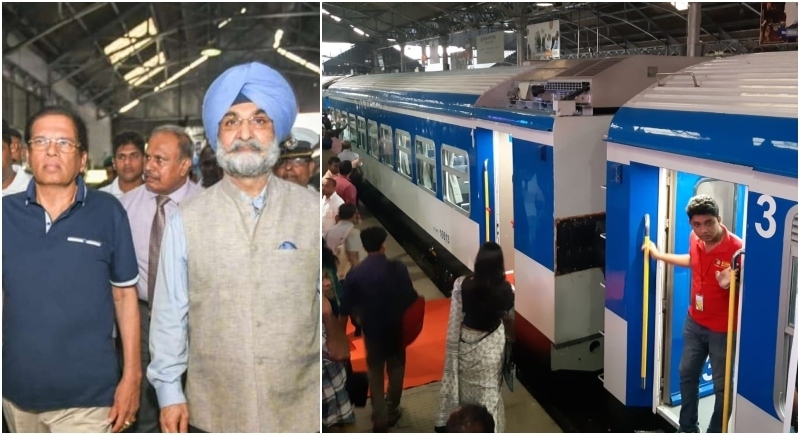 Sri Lankan Transport minister Arjuna Ranatunga And Indian High Commissioner to Sri Lanka Taranjit Singh Sandhu were also present on the occasion. Later the President and High Commissioner travelled on for some time. In March of 2017, India's Rail India Technical and Economic Service (RITES) and Sri Lankan Railways signed a contract for the supply of 6 DMUs and 10 locomotives to Sri Lanka Railways. The total contract, worth around US$ 100 million is financed under Indian concessional financing. The first set of DMU arrived in Sri Lanka in December 2018 ahead of schedule. The supply of rest of DMUs and locomotives will be complete during the course of this year. India has committed Lines of Credit worth around US$ 1.3 billion for development of railway sector in Sri Lanka. New Delhi is helping restore rail networks in north and south of the country devasted due to decades of conflict through Indian concessional financing and the Southern Railway line which was impacted by the tsunami is being upgraded under Indian Line of Credit. Under a line of credit of $167.4 million, the tsunami-damaged Colombo-Matara rail link has been repaired. In addition, 50 wagons are also being supplied to Sri Lanka railways under Indian concessional financing which will also be delivered this year. 500 buses will also be supplied to Sri Lanka under Indian concessional financing.